A friend sent me a very random online article about this and my first reaction was...this is a nasty April fools joke! But on the Buffalo Trace website, here it is! Unofficial article said $50 price point, and available on shelves by June, limited quantities of course...anyone in Ontario have a mule ready? I need this in my life. Note it doesn't sat Barrel Proof. Full Proof as they define it is the proof at which it went into the barrel. Likely the ABV increased in the barrel. This is likely OWA 107 with a touch more alcohol. And no filtration. 22 days ago 1Who liked this? I'm divided about this: I LOVE the OWA 107 (91/100 pts), but my bottle of W.L. Weller 12 Year Old is one of the most disappointing whiskies I've ever tasted. I would have rated my last pour from that bottle 70/100 if I was feeling generous. The finish just ruins the whole experience. It tastes like old, stale, Buckley's cough syrup. I haven't tried the Weller Special Reserve. So if the Weller Full Proof was closer in character to OWA 107, I'd be all over it. If it's like Weller 12, it will be a hard no from me. 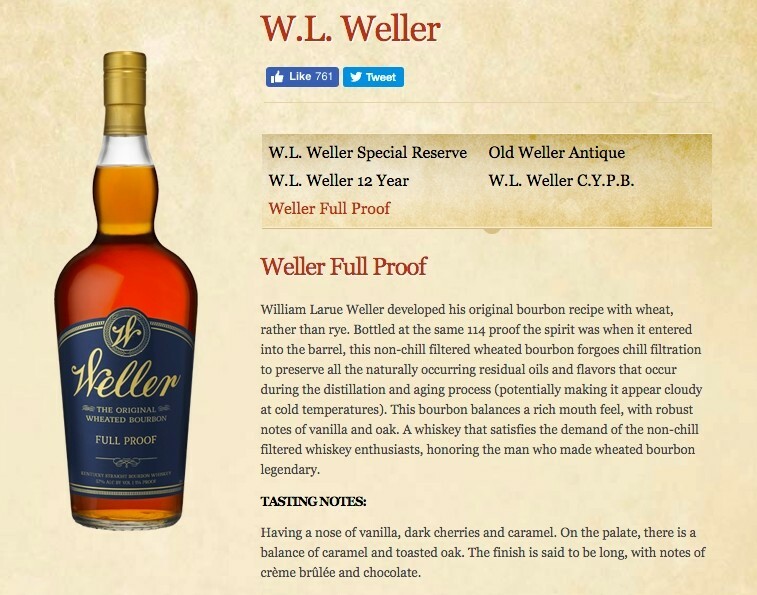 Weller Full Proof is "William Larue Weller Jr."
@OdysseusUnbound Weller Full Proof has no age statement, so it is not likely to be 12 years old. As for your Weller 12 yo, did you give it the 2 years of air time I advised? If not, ...wait for it...don't keep drinking it to finish the bottle if you do not like it. I always smile when I see you ranting about that bottle of Weller 12 of yours. Why? Because I had the same experience, and for years and years only I and @cherylnifer would utter a less than enthusiastic word about Weller 12 on Connosr. Weller Full Proof sounds to me like a step even closer to the moniker of "William Larue Weller Light" that I have in the past applied to Old Weller Antique 107. 57% is a far cry from the 70% ABV that William Larue Weller sometimes attains, but I swooned over my sister's now extinct bottle of 2007 release William Larue Weller which was at 58.95% ABV. Weller Full Proof does not have the age of William Larue Weller, I am sure, or it would be William Larue Weller. This is clearly the "Stagg Jr." version of William Larue Weller. This is an outstanding idea, and I hope that it will be generally available for a very long time. This is the sort of thing that Buffalo Trace has to do to deflect away from the scarcity and free-market-cost of its top products...a relatively attainable and hopefully affordable William Larue Weller Light. Behold William Larue Weller, Jr.
22 days ago 2Who liked this? Having never tried the Weller 12, I can't speak to it, but the Antique 107 is easily one of my favourite bourbons to date. The Special Reserve carries much of the same character as the 107 but with the volume turned down. So needless to say, at LCBO prices, where the Special Reserve is actually more money, it doesn't make sense to me. @Nozinan In Kentucky, how much does the ABV generally increase during barrel aging? Do they come to expect a certain amount per year, or does it vary depending on rickhouse location? @dloewen It's the LCBO, it's not supposed to make any sense whatsoever. Their prices change literally every day on some whiskies. I've not experienced the joy of a WLW or a GTS but Stagg Jr is fantastic. I've surprised more than a few people when I reveal the abv of my current opened bottle (65.95% abv) because it's far smoooooooooooooooother than a lay person might think when seeing that number. @dloewen US straight bourbons and ryes go into the barrel at a legal maximum of 125 US proof/62.5% ABV. In the US it is typical for whiskeys to gain alcohol content over aging with the amount varying with the climate of the specific area within the US where the whiskey is aged, the specific weather during the years aged, and also with the temperature changes according to specific positions within the rickhouses where the barrels were aged. ABV increase in US whiskey is quite variable, but it is typical for a Kentucky bourbon, e.g. Elijah Craig 12 yo Barrel Proof to be bottled between 62% ABV and 70.1% ABV, after, yes, 12 years. On the low end Wild Turkey Rare Breed is intermediate aged and bottled in the low to mid 50s ABV-- 52-56% ABV-- for a blend of whiskey averaging about 6 years old. Wild Turkey enters the barrel at a lower proof, I believe, which has a lot to do with the final proof being lower than the average for other large US distilleries. Booker's is usually at 62-66% ABV after only 6 to 8 years. I have Virginia aged 17 yo Abraham Bowman bourbon bottled at 73.75% ABV/147.5 proof, and I have Virginia Aged Abraham Bowman 10 year old Rye at 69.4% ABV. Jim Murray reviewed one bourbon which was bottled at over 80% ABV. @OdysseusUnbound speaking of smooth, if you get the chance to sample 2010 George T. Stagg, 71.5% ABV or Abraham Bowman 17 yo 73.75% ABV you will not need to add any water. The creme de la creme high ABV whiskeys do not have a fierce alcohol greeting. 22 days ago 3Who liked this? @dloewen you are very welcome, or as they say in Quebec, apres 'merci', "bienvenue!". I know the Old Weller Antique107 once carried a 7yo age statement. Obviously, that got dropped back in the mid 2000's somewhere. My understanding is that the Weller Antique 107 was essentially the same juice as the Weller Special Reserve just at a higher ABV. I have bought way more bottles of the 107 than any of the other products. It was my mixing bourbon back in late 2000's and early teens. Until it became impossible to find. I have had great bottles and off bottles. I always guessed the OWA107 was 5-6 years of age with some 7yo in it. And I always assumed the Weller Special Reserve was 4-6 years of age. My guess is that this Full Proof bottle will probably 4-6 years of age and essentially be the Weller Special Reserve at 57%. But I think @Victor is correct that they are going for the "Stagg Jr." move here. They have put in print that Stagg Jr. is between 8-9 years of age. I would love to see them make the same statement about this Full Proof bottle. But I doubt it will be the case. 17 days ago 2Who liked this? Just kidding, I think you're right I wondered myself what the aim of this release is if we consider that stocks of anything Buffalo Trace are heavily allocated. The Weller line-up with it's associated scent of Pappy is worse off, so why created a 4th product when you have limited stock of the other 3? I'm guessing that they probably started upping production a few years ago, so might have some very young stock that's not quite ready for the other three streams. At the same time they'll capture a certain target market, the barrel pick folks who are always asking for more high proof, non chillfiltered products. 16 days ago 1Who liked this? @cricklewood I think your last statement is most true! The glossy, romantic side of me likes to think that as Julian Van Winkle III is strolling up and down the isles looking for his one in a million "Van Winkle barrels", the Buffalo Trace rep toddling along behind him is shaking his head and muttering under his breath..."what are we gonna do with all the rest!?!" In reality, I think BT is just good at knowing who their customers are, and where the whiskey industry is moving. It's not a bold enough move to just bring out a non-chill filtered version (like Beam did with the Repeal Batch)...so up the proof! @dloewen, @cricklewood you said it well: Buffalo Trace is giving its customers a new product that they want. The US market traditionally accepted a 50% ABV drinking strength, the Bottled In Bond standard, for whiskey, until very recent decades. It was really when whiskey's popularity went downhill in a big way in the USA during the 60s, 70s, and 80s, that the 40% ABV stuff first came into widespread circulation. The higher proof products were always available even during this period. Wild Turkey didn't introduce some of its 40% or 40.5% ABV products (e.g. Wild Turkey 81 proof Rye) until VERY recently, and then in response to running out of stocks because of the huge upsurge in demand for certain whiskey products. The US bourbon and rye market has always been accustomed to ABVs which would seem high by UK or vodka drinkers' standards. That said, the current widespread US interest in whiskeys at or near barrel strength is a rather recent development. Long may it live! 16 days ago 2Who liked this? From what I have heard among Bourbon enthusiasts, this will have an instant secondary price in the BTAC GTS/WLW range or higher. So I will have to settle for my last remaining OWA 107's and enough W12 to make 2 more full bottles of PMP's. @Astroke I have left Stagg Jr on the shelves several times. I don't believe that I would leave Weller Full Proof on the shelf, not before I owned 3 or 4 bottles of it anyway. . I am saturated with Stagg Jr. It doesn't get consumed that quickly. I ended up with 2 bottles of a batch I'd prefer to have one of. I may buy a new batch in the future but currently I have 3 open and a few backed up. @Victor Not sure this one will see the shelves, looks like an instant cash grab from what I have heard. Much more sought after than the Weller C.Y.O.B. and that was selling in the $300+ range. If anyone can come up with a bottle at retail or there about's it will be you, at least I hope you do. 15 days ago 2Who liked this? @Astroke thank you! Such a kind sentiment! I would certainly like to drink some of this new Weller Full Proof...and own some.